A Palestinian fishing boat was set on fire, Thursday, after Israeli naval forces repeatedly opened fired towards it off of the coast, in the northern besieged Gaza Strip. 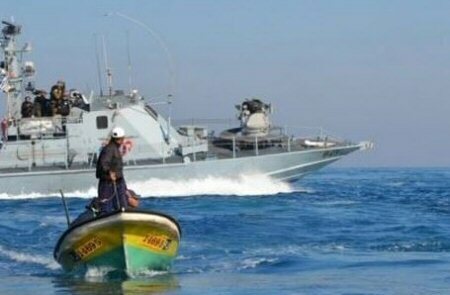 Head of the Palestinian Fishermen Union in Gaza, Zakariya Bakr, said that Israeli naval forces opened fire towards Palestinian fishing boats located three nautical miles off of the northern coast of Gaza, causing a fire to ignite in one of them. Bakr confirmed, according to Ma’an, that two Palestinian fishermen were present on the boat as it caught on fire due to repeated gunfire. He identified them as Mahmoud Hamoud Ishkantana and Mohammad Mahmoud Ishkantana. The two fishermen were detained by Israeli naval forces and taken to an unknown location. As part of Israel’s blockade of the coastal enclave since 2007, the Israeli army, citing security concerns, requires Palestinian fishermen to work within a limited “designated fishing zone,” the exact limits of which are decided by Israeli authorities and have historically fluctuated.